Profile of Dr. Fredrik Hiebert, archaeologist and National Geographic Fellow. Fred is an archaeologist. He mostly studies ancient trade routes, such as the Silk Road, a network that stretched from China to Europe. He also leads underwater archaeology projects, such as searching for evidence of prehistoric settlements on land that is now beneath the Black Sea. Another part of Fred’s job is putting together exhibits of archaeological discoveries for museums and other venues. Fred has a strong background in both archaeology and education. After earning a PhD from Harvard University, he spent 10 years as a professor at the University of Pennsylvania before joining the National Geographic Society as its archaeology fellow. Although Fred’s early work mostly focused on trade routes, he has since studied civilizations and artifacts from places as diverse as Lake Titicaca, Peru; Athens, Greece; and Kabul, Afghanistan. One of Fred’s projects for 2012 involves studying the ancient Maya. Many people immediately react to the “doomsday” Mayan calendar date of 2012 instead of the rich, varied culture, he says. “That’s a misreading of the calendar, by the way! The Mayan calendar doesn’t end, and there is no doomsday. But the reality is better!” Fred says. Fred defines geography as the ability to identify regions and put them in context—in terms of conflict, history, and culture. 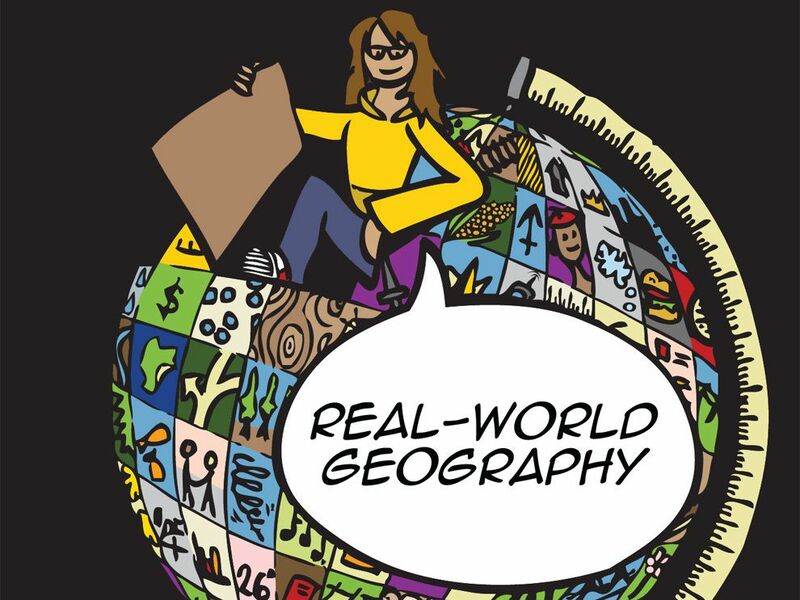 “The need for geographic literacy is one of the reasons I left U-Penn. In October 2001, I gave a map quiz on Central Asia in my seminar on the Silk Road. I realized a lot of my students couldn’t find Iraq or Afghanistan on a map. Here we [the U.S.] were in two major conflicts, and these smart college kids didn’t know where these places were. Fred is enthusiastic about bringing educational experiences to the public, and doesn’t limit himself to traditional venues like schools or museums. Fred explains one recent exhibit that brought rare treasures to Singapore and Oman. Fred also worked with Lucasfilm, the film studio of Star Wars and Indiana Jones producer George Lucas, to develop the exhibit “Indiana Jones and the Adventure of Archaeology.” The exhibit links the fictional quests of Indiana Jones to real-life archaeological sites and discoveries. Lucasfilm provides video clips of the swashbuckling archaeologist hero, as well as movie memorabilia. National Geographic and the Penn Museum provide the archaeological treasures, including gold artifacts from the royal cemetery at Ur; intricately decorated bowls from Nazca, Peru; and one of the world’s oldest winemaking presses, unearthed in Armenia. “An entire generation was inspired to take Archaeology 101 by Indiana Jones,” Fred says. That search for knowledge is the other part of Fred’s job—field archaeology. It has taken him all over the world. His most well-known exhibit is probably “Afghanistan: Hidden Treasures from the National Museum, Kabul.” Fred did most of his archaeological work in Afghanistan in 2003, during a lull in the conflict there. “I could actually walk to work,” he remembers. Fred has also worked on underwater projects in Lake Titicaca, Peru, and Lake Issyk-Kul, Kyrgyzstan. His newest proposal has taken him to Greece, where he’s developing an exhibit with the government. “There is a lack of broad generalists in our field,” Fred says. He strongly encourages students to have a liberal arts background. Fred encourages families to visit museums, outdoor parks, and historic exhibits or demonstrations. Fred Hiebert is an archaeologist. having to do with the study of ancient people and cultures. representation of spatial information displaying depth underwater. place for burying the dead. date on which a disaster or the end of the world is predicted to take place. process of acquiring knowledge and critical-thinking skills. display, often in a museum. industrial center where movies are filmed and produced. large population, not identified by demographic factors such as skills, income, or ethnicity. series of movies (named after the main character). wide-ranging course of study including the arts and social sciences. souvenirs, or objects associated with a specific collection or set of memories. space where valuable works of art, history, or science are kept for public view. experts who provide the National Geographic Society with consultation on projects, education and outreach, and environmental and public policy. period of time that occurred before the invention of written records. highest-ranking teacher at a college or university. (1942-present) oceanographer and National Geographic Explorer-in-Residence. having to do with a monarchy. remains of a sunken marine vessel. ancient trade route through Central Asia linking China and the Mediterranean Sea. having to do with maps based on natural and human-made features of the land, and marked by contour lines showing elevation.